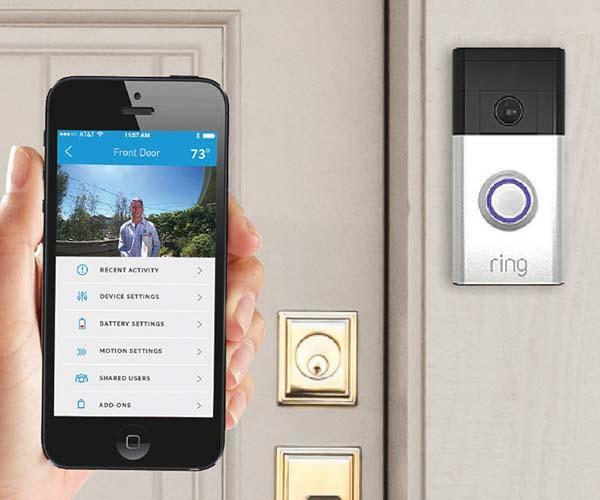 With the Ring, you can answer the door and get a live video via your smartphone or tablet. If you think it’s a nice idea, let’s go on checking the smart video doorbell. The Ring is an innovative and functional WiFi enabled smart doorbell that measures 1.3 x 2.39 x 5.68 inches. The video doorbell sports a sleek and modern design in order to decently keep itself on the wall beside the door, and it comes with built-in WiFi connectivity that allow it to join in the local network and wirelessly connect with your smartphone and tablet. When a visitor press the doorbell, it can chime on all your connected devices, and its HD cam with 2-way audio and night vision lets you see clear live video and answer the door no matter you’re at home or outside. Moreover, the smart doorbell also features built-in motion sensor. When detecting any movement, it can automatically record video and send notification to your smartphone. Apart from that, its rechargeable battery offers over one year of regular use. After the break, check out the following demo video. The Ring smart video doorbell is priced at $115.97 USD. If you need it, head to Amazon for more details.